Drawing in watercolour and pen and ink over pencil. A white rabbit scurries away to the back of a corridor that spans from the left foreground to the right hand background of the illustration. Corridor is red-carpeted and wooden paneled. Fan and gloves are left on the floor in the foreground. 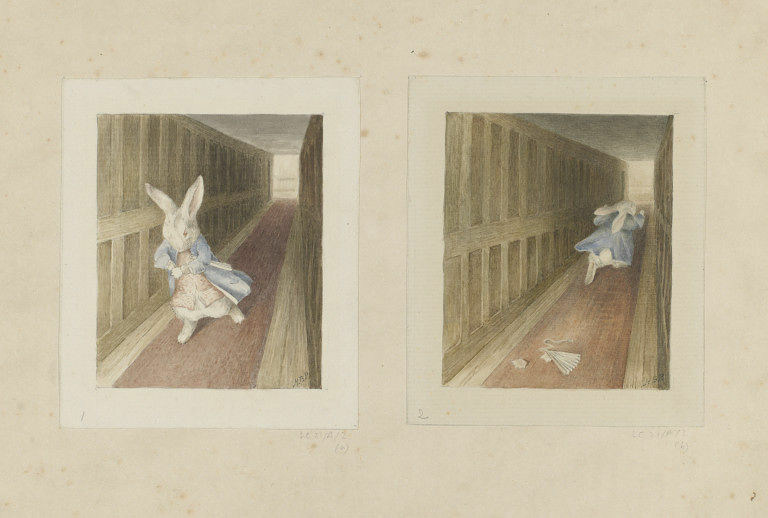 Drawn by Beatrix Potter, circa 1892. Given by Leslie Linder (1904-1973) to the National Book League (now the Book Trust) in 1970 as part of a representative selection of Beatrix Potter's work. This selection, comprising 279 drawings and 38 early editions and now known as the Linder Collection, was acquired on long-term loan by the Victoria and Albert Museum in 1989 and remains the property of a charitable trust, The Linder Trust. Hobbs, Anne Stevenson (compiler). 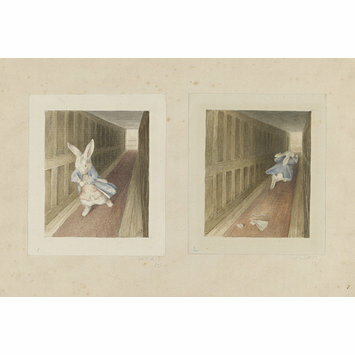 The Linder Collection of the works and drawings of Beatrix Potter: catalogue of works on paper. London: The Trustees of the Linder Collection, 1996 (1999 reprint).